So we squeeze one more message into the already-overloaded communication. We bold and underline our features so she can’t miss them. And just to make sure, we throw in a blinking starburst and a few more exclamation points so she doesn’t inadvertently pass us by. Then we sit back and scratch our heads when none of it seems to have much of an effect. The harsh truth: It's not about you or your brand. We live in a world that inundates us with information. It has become harder and harder to know what to pay attention to. And we are paying. We have a limited store of energy each day. And with so much calling for our attention, we have become miserly with what gets our regard. Today, more than ever, it is critical to address this problem that is holding back most brands. It starts with this simple truth. It’s not about you. It’s just a fact. You are not the hero of this story. Your prospect is the hero. This is why they are not paying attention to the story of how great you are. The thing is that they’re willing to listen. But they are waiting for that story that sweeps them up and helps them understand how their life can be better. Or how their aspirations could become a reality. Or even better, how they could become part of something that makes the world a little bit better place. 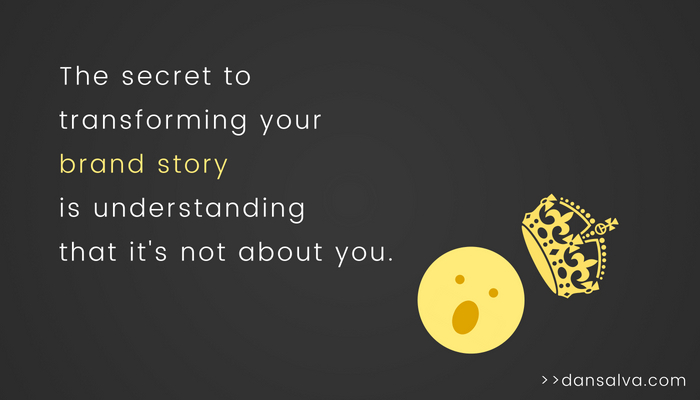 Your brand has a role in this story. It’s not the hero. It’s more the sage guide. It’s the one who helps facilitate the discovery. Think of your brand as the Obi Wan to your prospect’s Luke Skywalker. You’re there to help him on his journey. And to eventually experience that triumph.